Today myself, my community and my children woke to the sad news that a bright beautiful senior at my kid’s school was killed in a car accident overnight. How? Why? Disbelief. Shock. Sadness. So much tragedy… so, so much that sometimes my heart swells up and breaks in half, no words, no breath. We are left wondering why does this happen? The soldier who comes home with only a folded flag to give a fellow soldier’s family, my best friend imprisoned in a wheelchair as her body stops working a little bit more each day, my father who got a call with results he hoped would not come this soon. All of it too soon. Why does God let it happen? I tried to get my head around it. I laced up my running shoes and set off for the trail. It is always a good place to think, reflect and pray when all of this sadness was at my heels. When I sat on the bench to get my music started I heard two old men talking about their churches. They are good friends, they are here walking often together and they worship at two different places. One man was saying his church had good music, and they agreed that the other one did not. But it did have Johnny and apparently Johnny is really good thing to have. Living in the south you come to realize that we are all believers. We don’t all go to the same church but we have the same God. We have the shared sorrows as well. We all pray. As I set off I kept thinking that we are one family of believers. On my next loop around the trail I decided to stop and ask these men to pray with me for the family that lost their daughter last night. Total strangers to me but brothers and sisters in Christ. It filled me with renewal that God never leaves us alone. We have a tremendously large family of support. His command is to love, and we need to keep that command by giving it, but also by receiving it. What do we do when we are the ones left here on earth? Imagine that each day you are given a pack of seeds. Sowing these seeds of faith could be as simple as a text to check in on someone, or driving right into a friends driveway and walking up to their door with the intention of only a hug and an offer of a shoulder to share the burden. Our sensitive hearts together make us strong. When my kids got home from school they told me about a ceremony that they had at school today in honor and memory of their fellow student. 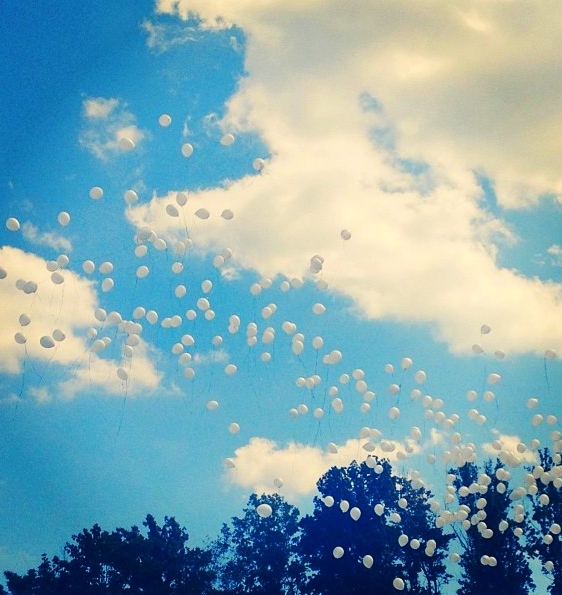 In just a few hours our community had come together remembering her, praying on bended knee for her family and released hundreds of white balloons on the football field. I am awed and honored to be a part of a community of faith and support like the one we live in. Will the path to heaven be lined with joy and jubilation when we arrive to fist bumps and high fives? I do not know but I do know that as one body in Christ, we sow the seeds until then, scattering them everyday.